So this seems really tempting to me. 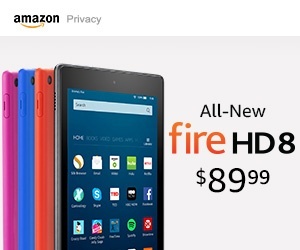 Amazon is releasing their new Fire HD 8 in less than two weeks, on September 21st. This is the 8 inch version of their HD Fire tablet, and they have managed to lower the price while adding some cool new features, including an SD card slot for expanded storage. The biggest new thing is that it will have Fire OS 5.4 operating system which will have Alexa, which is Amazon's voice response feature (like Siri is for iPhones). I think all Fire tablets will get Alexa with the upgrade. Question: What do I do with my old kendal that works just fine and has a battery life of sever days? Answer: If you activate transformer mode on the new Fire HD 8, it will mechanically absorb your Kendal and become twice as big and with battery life for weeks. The Fire HD 8 can be pre-ordred now and will be available on Amazon starting September 21.